My Mum was an only child, born to very conservative parents. As a kid, life was pretty dull. As Mum had 3 children of her own, Christmas soon became her favourite day of the year. She loves everything about it – the decorations, the food (especially pork crackling), being surrounded by family and friends, sharing gifts etc. On Christmas morning, Mum was always the first awake – usually around 4:30am. She would ask Dad, “Can I wake the kids up yet?” The answer was always “Don’t be so bl___y stupid!” So Mum would ask every 5 minutes, until he caved in. Needless to say, I grew up with the same passion for Christmas. The year I had my stroke, my kids were only 5, 8, 10 and 12. To them (and me), Christmas was still the most wondrous time of year. The thought of being away from them on Christmas Day was too much to bare. At the age of 36, I had only missed spending Christmas with my Mum and Dad on 2 occasions. 2011 was the first year Katie had shown any interest in helping me shop for gifts. She was growing up. We were so excited to plan our first big shopping trip together, scheduled for Friday night, 16th December. I selfishly had my stroke, and the shopping trip was cancelled. So with Christmas fast approaching, and no shopping done, it was time for a plan. From the day of my stroke, Mum had left her home in Brisbane and basically moved in to our house. She was committed to staying as long as we needed her. She kept the house running while providing support to Steve, the kids and me. At Christmas, my Dad was still here too. Ali too had been here the entire time. Damo and the kids came and went as required. Pete and Courtney decided they would come back down for Christmas too. So my whole side of the family was here together for Christmas. Mum, Ali, Courtney and Katie hit the shops in search of gifts for my kids. They did a great job under the circumstances. I had taken some of the joy out of Christmas that year! A couple of days before Christmas, Jane (discussed in an earlier post) and her gorgeous friend Toni (who tragically passed away last year), arrived at the house with boxes of gifts their friends had donated for the kids. 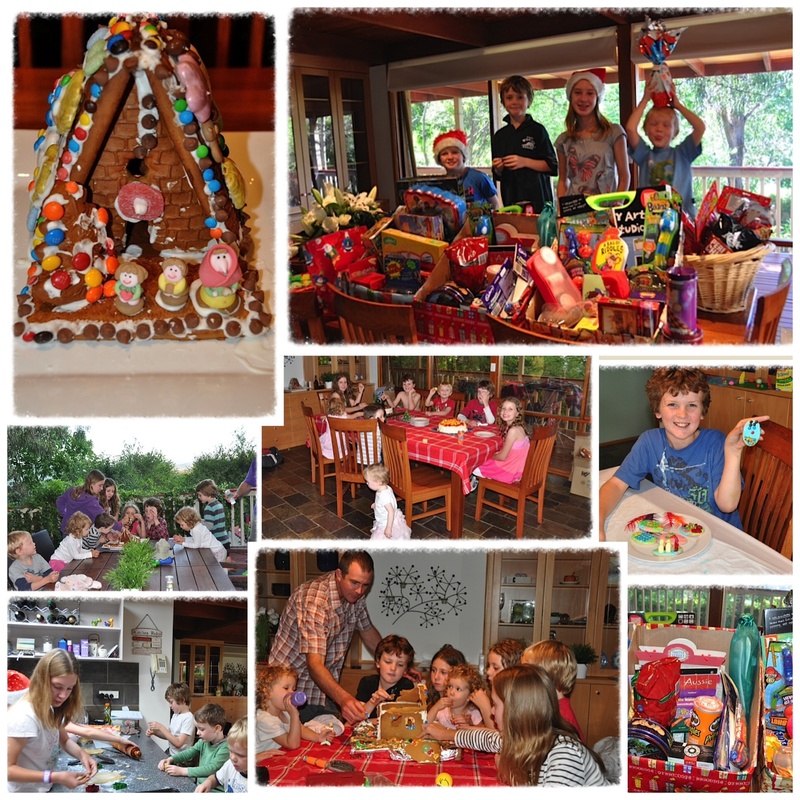 Ali and Courtney helped the kids make gingerbread houses and biscuits, so family traditions remained alive and well. In many ways the Christmas spirit filled my home and the kids hearts, through the love and effort of my family. I remember the lead up to Christmas. Nurses would be talking to each other over me about their plans for Christmas Day. Where they were having lunch, presents they had bought, arguments they’d had with in-laws etc. As they complained, I would think how lucky they were. 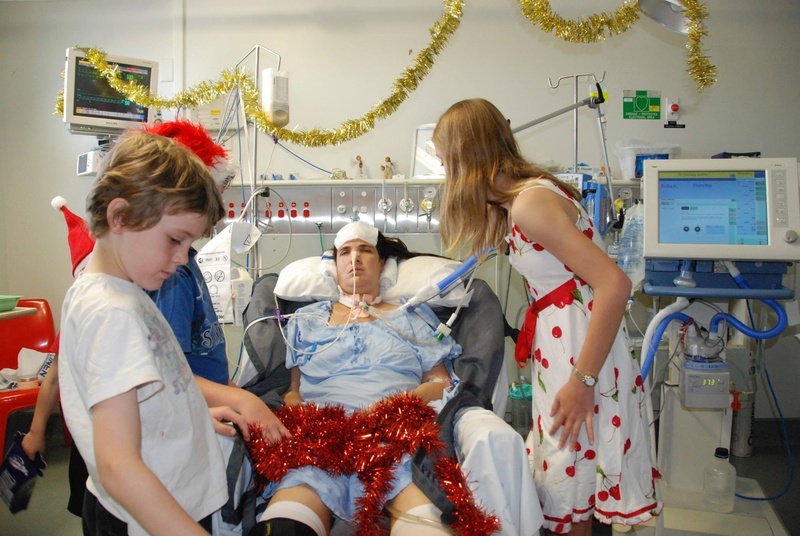 It was so strange knowing that I would be spending Christmas Day locked-in in hospital. On Christmas Eve I remember a nurse helping Ali wash my hair. They were making plans to take me outside on Christmas Day to spend time with the kids. I don’t know what drugs I was on at that stage, but I remember quite clearly believing I was outside. I was surrounded by many other patients. I thought we were watching a movie on a big screen. I was very uncomfortable and didn’t want to be there. It had now been nearly 2 weeks since I had had a drop of water in my mouth. I was craving a drink. On Christmas Eve I prayed so hard that I would be able to skull a bottle of water on Christmas Day. I didn’t even think to pray for a full recovery – I just wanted a drink! I really believed it would happen. I was convinced my Christmas miracle was going to be a drink. Steve was going to stay the night with me on Christmas Eve. We all knew it would be a tough night for me. As much as I wanted him to stay, in the end I asked if he would stay at home with the kids. They love my Mum and Dad and their Aunts and Uncles very much, but I couldn’t cope with them waking on Christmas morning without me or Steve. So Steve phoned home and without hesitation Mum had agreed to stay with me. I had a very strange experience that night. I still have no idea what actually happened or if I was simply dreaming. I was convinced I had been taken to another room and put on a revolving magnetic therapy machine. It felt like my legs were being magnetically pulled against the machine. Then Mum arrived. I was really distressed. I was blinking frantically, asking her to get me down. She didn’t know what I was talking about. I became hysterical and was trying to scream, over and over again. There was no sound coming out. Poor mum was getting really stressed, looking to the nurse for help. Mum was starting to worry that screaming so hard would pop my trachy out. I don’t remember what happened after that. I can only imagine how it made Mum feel, if in fact any of it actually happened. One of the male staff members had promised me and the other patients that we could have a lemonade ice block on Christmas. I had been looking forward to it for days. Mum had stayed the night. Dad came in early. I was still disorientated from the night before and thought I was still in that other room. I felt like there were lots of patients around me but in fact I had been moved to a private room. My lemonade icy pole arrived. Mum broke it up into small pieces. My jaw was still locked, so Mum put it in my mouth, 1 piece at a time, down in front of my bottom teeth. I got a little of the taste as drops made it through gaps in my teeth. I had no control of the muscles in my lips and face, so I was unable to move the piece of icy pole. It just sat in the one spot till it melted, freezing my gum in the process. At times it was actually painful, but I wasn’t going to let them stop. Mostly it just dribbled out my mouth – but it was a change in routine and I relished it. I sent Mum and Dad home to open presents with the family. It was such a strange feeling knowing it was Christmas yet not really feeling like it. Steve and the kids came in mid-morning. They brought presents for me. They were so excited. I felt awful not being able to show any excitement or appreciation in return. They all talked a million miles an hour, reporting on gifts they had received. Oh how I wanted to be at home with my arms wrapped around them all. I can’t remember what set it off, but I smiled for the first time since the stroke. When Steve and the kids were there, I smiled. Steve was almost in tears, saying it was the best Christmas present he had ever received. It must have been nice I guess, after weeks of really having no idea what was going on in my head, to know that on Christmas Day, with the kids around me, I was happy. My family took it in turns trickling through to visit during the day. I felt so guilty when they visited. They should have been at home relaxing, with a drink in their hand. When Pete and Courtney came to visit in the early afternoon, I quickly established that they had not yet had Christmas lunch. Every five minutes I would blink for them to go. But they would not leave. My family all made sure on Christmas Day,day, that I didn’t feel alone. I never did get my Christmas wish that day – a nice big drink of water. But the children were happy and that was all that really mattered to me. Plus I had smiled at my beautiful husband and managed to make his day. Overall, it was by no means the Christmas I would have wished for. Yet there were still plenty of blessings to count and give thanks for. My home was filled with loved ones, able to comfort each other. My kids were surrounded by gifts, good food and the laughter of 6 of their beloved cousins. It was a very good reminder to stop and give thanks for all that we DID have, not stew on those things we didn’t have. As we stop as families to celebrate Christmas, we need to remember that in fact, not everything stops. Thousands of men and women keep working so that vital services keep running. Hospitals are full of cleaners, cooks, wards men, lab staff, imaging staff, doctors, nurses etc who all work together to ensure patients receive the best possible care even on Christmas Day. They too have families they long to get home to. Nicely said. To all my health industry friends, thank you. And thanks for the reminder to give thanks! So sad to hear about that first Christmas after the stroke. Hope this one is a hundred times better. I’m working this Christmas Day, thanks for remembering us!